Elisabeth Taylor died last week. I came across these portraits in downtown Amsterdam somewhere. I doubt if these are genuine Warhol reproductions. Taylor looks like the Joker’s little sister with that thick smile on her face. And that’s not how I like to remember this diva of the silver screen. Rest in peace, Elisabeth. Hey, that's in my street. Reflex Gallery. I saw them a couple of days ago & didn't even know it was supposes Ms Taylor. 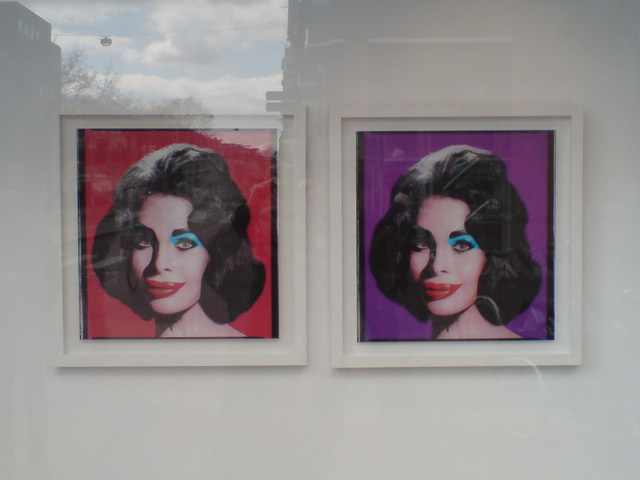 I just got irritated because I think the Warhol-shtick has been worn out years ago. I believe these are David LaChapelles.